Finally! I actually finished something! My "Random Socks" are done! They're "random" because there are lots of little weird things about them. 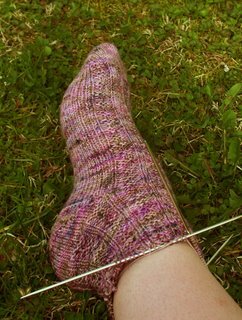 For example, if you look closely, I used a figure-8 cast on for the toe of the sock in the back, and a short-row tow for the sock in the front. I wish that I had been a little more patient and made the cuffs taller. I guess I like tall socks. But really, for a first pair, they're not too bad. I talked to my landlord today and looked at one of the bigger apartments that they have available. The one I think I'm going to move into isn't available yet; the current tenant will be out by May 1st. They still have to have the carpets cleaned and so forth, so I will probably be moving in around the Ides of May, or maybe the beginning of June. It's so BIG--about 2 times larger than my current apartment, but since I'm going to be rooming with a friend of mine, my rent is actually going DOWN. Yay! I actually have an FO today--I finished the second sock! It's had a bath, and it's blocking right now as we speak. I'll have pictures tomorrow. I actually have the day off! (yippie!) I plan on getting a lot accomplished: I have a package at the post office to pick up, laundry to do, and my apartment to deep-clean. I found out this week that I'm going to be moving to a new, larger apartment in my complex. The manager told me on Wednesday that it was going to be available "at the end of the month." What she didn't say was if that meant "in four days" or "at the end of May". I should find that out tomorrow. 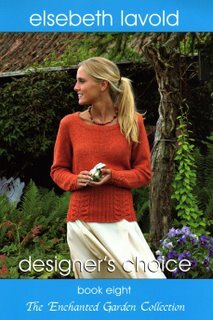 "If you please, ma'am, the post is come..."
I kind of like the look of the orange sweater on the front. I didn't like how the green sweater I was making was turning out, so I started hunting for a pattern I liked. Then I found this one, and RRIIIIPPP! I started organizing my growing stash. 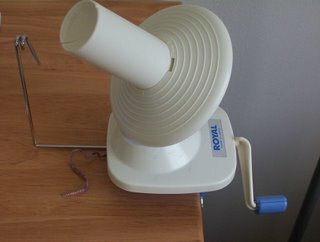 What a fun toy! Then I started the other one. The first sock was cast on with the Figure 8 method from Knitty. I like that it doesn't require any scrap yarn. Unfortunately, about four rows in I realized I had dropped a stitch at the very beginning. Since I was going to have to start over anyway, I decided to try the short-row method. And I like that better, I think. So as you see, the toes on the socks won't match...but I tell myself that no one is REALLY going to notice. I just want to actually finish them! 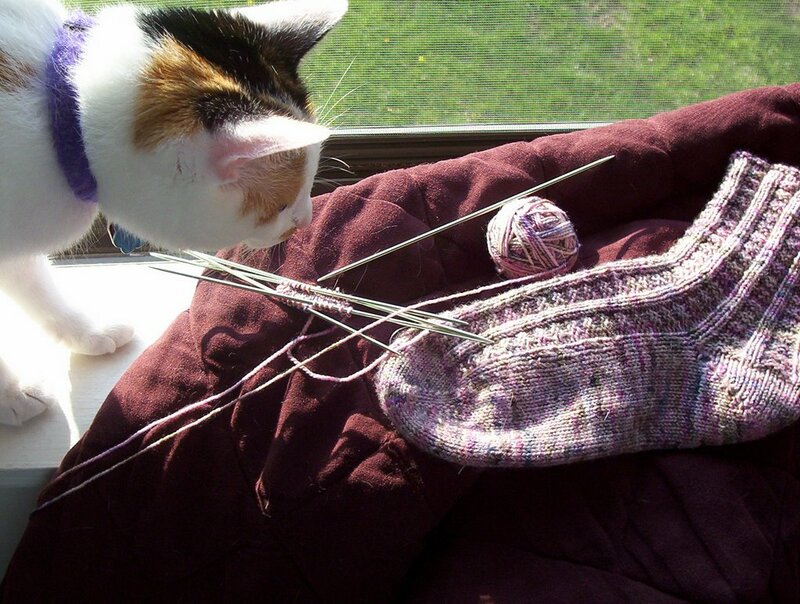 Here's Mattie, my cat, with the sock earlier this afternoon (when I was starting the second sock with the Figure 8). I think I have knitting ADD. Well, it's been a while since I've been here. I just signed up for Secret Pal 8, and I realized I haven't posted since the beginning of the month. I have been doing some knitting, but I don't have a lot to show, since I frogged most of it! 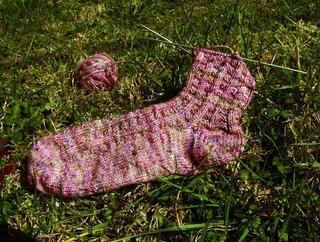 I finished the sock I was working on several days ago, but I haven't started its mate. I'm planning on doing that tomorrow evening, since I'm out of time tonight. I've been shopping, but more on that when my orders get here! I got off work at 11:30 this morning--yippie! I made some lunch, and went outside and enjoyed the nearly-70 degree weather and took a picture of my sock. 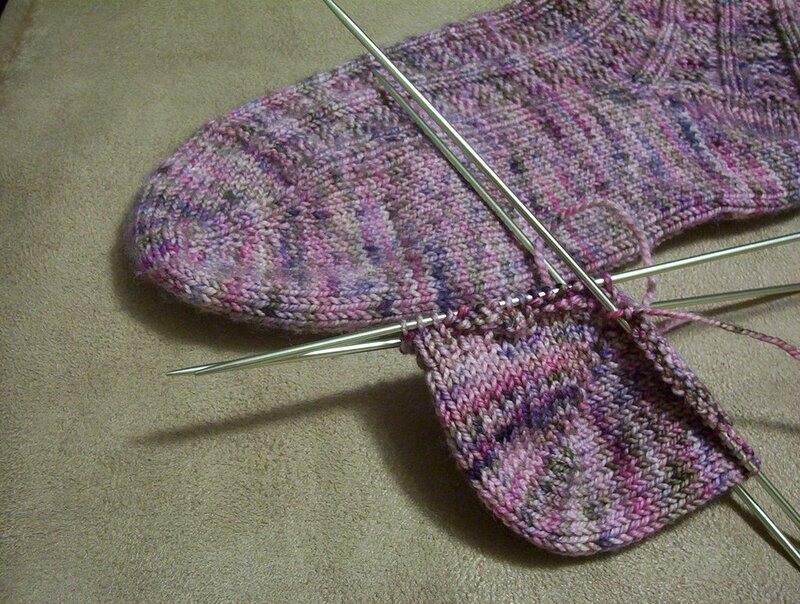 I turned the heel last weekend, and I got a lot of the cuff done yesterday in the car down to Louisville. So far, I really like the sock. 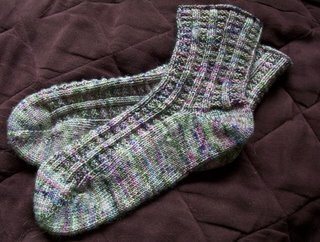 I like that it's snug on my foot, and the pattern is pretty stretchy and interesting.